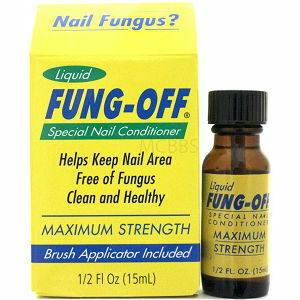 Fung-Off Special Nail Conditioner is a topically applied ointment to aid in the healing of Nail Fungus. Clean affected area with warm soap and water. Thoroughly dry area. Brush topical solution on nail and under the free edge with applicator. Fung-Off is priced at $10.33 for a half-ounce bottle. This is approximately a one month dose. I found no mention of a Money-Back Guarantee for Fung-Off Special Nail Conditioner. Because the mild active ingredients, there are no known side effects from this product. You may, however, experience redness and dryness at the site of application. Fung-Off Special Nail Conditioner is a mild treatment for the relief of Nail Fungus. Because the active ingredient is mild, you may have to use a longer period of time than some other products. With a price of $10.33 for a half-ounce bottle, and no money back guarantee, Fung-Off Special Nail Conditioner may become a pricey solution. Jack Stevens	reviewed Fung-Off Special Nail Conditioner	on July 23rd	 and gave it a rating of 3.